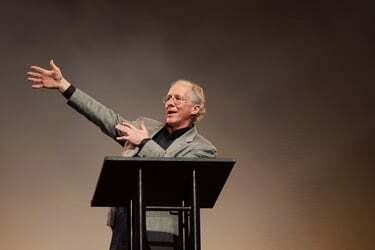 The 2011 Ligonier Ministries National Conference continued this afternoon with a session led by John Piper. This was a kind of autobiographical address in which Piper explained how he came to see the importance of not wasting his life. When he was 17 something in him came alive—not a faith, since he was already a Christian, but an awakening of the wonder and the weight of having one life to live and then its outcome for eternity. There would be no second chances, no retakes, no do-overs—just one life and then eternity. There arose this sense of purposefulness, this question of where am I going and what’s it for? In the next 7 years all of the big pieces fell into place and they never changed. All he has been doing since then is keeping his view narrow, fixed on these few things. He affirmed that you don’t have to know a lot of things for your life to make a difference, but you do need to know a few great things that really matter and then be willing to live and die for them. The people who make a durable difference in the world are mastered by these few great things. This is what makes a life count. He mentioned three of those things, three things that became clear to him in those years between 17 and 24, giving them as three statements (which I will relay in bare summary form—you’ll want to find the audio or video and listen in for further detail). First, there is an absolutely sovereign, transcendently pure, self-existing, self-sustaining, all-knowing, all-wise, all-governing, infinitely valuable, all-satisfying God whose purpose in all creation and in all redemption and history and culture is to display his glory for the everlasting enjoyment of his redeemed people. Said in a short sentence, there is a great holy God who means to be known and treasured duly as God. Second, there is a massive obstacle between God’s purpose and my participation in it. I hate God; I want to be God; I don’t want to live for anybody else. Self-denial is not in my bones. I don’t want anyone telling me what I must love, what I must do. And God is against me because of this. So how will God’s purpose ever be achieved if all people are children of wrath? Here is the second discovery: Jesus Christ, the Son of God, not only becomes the means of my seeing and savoring the glory of God, but in the very act of overcoming these obstacles, becomes himself the apex of the glory I couldn’t see. Jesus enters the world as a God-man and does something that covers and conquers my depravity and absorbs the wrath of God so I can now see and savor what I was meant to see and savor. And in this Christ becomes the apex of the glory of what I was designed to see. Third, the life that most clearly displays the infinite value of the glory of God manifested supremely in Christ crucified for sinners, is a life of joyful suffering in the service of love.